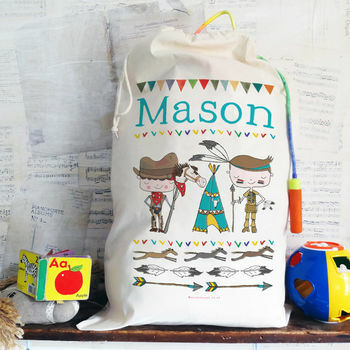 A personalised cowboys and indians cotton toysack. Cowboys and Indians pretend play is a kids classic! Excellent for tidying away LOTS of toys, and makes tidying up more fun! Printed in England, this extremely useful and delightful personalised toy storage sack is suitable for all ages and will give years of enjoyment. Why not purchase for a new baby gift as an alternative to the traditional toy or blanket? Or how about for a Christening or naming ceremony gift?